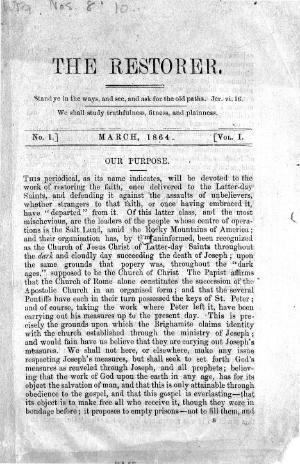 The religious periodical of the Reorganised Church of the Latter Day Saints that mainly published religious articles. Originally a bilingual monthly publication, it was published irregularly between October 1864 and December 1865, and became an English language periodical in 1866. The periodical was edited by Jason W. Briggs until August 1864 and between December 1868 and September 1869, by Thomas E. Jenkins between October 1864 and December 1865, and by Josiah Ellis from October 1869 onwards.